Optional Extended Season – Extends Regular Season through the first Sunday in November (additional fee and restrictions apply). Seasonal Camping only – Lost Lands does not offer short-term/transient camp sites; No Tents. Speed Limit – 5 MPH strictly enforced. 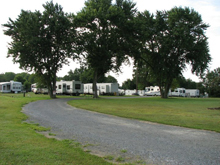 RVs – Entry age restrictions apply. RV-Certified Park Models must be self-contained with black water holding tank and RV-type flush toilet. HookUps – Each site includes: Individual Electric Meters with 50-Amp and 30-Amp service and a 20-AMP recepticle for auxiliary use; Septic hookup; Water hookup; Cable hookup. Some sites have phone hookups. Water and septic are included in the site cost. Satellite dishes permitted. Site Size – all sites are minimum 2,000 square feet (approx. 50’ x 40’). Motorcycles, Scooters, Mopeds – Permitted in Lost Lands for licensed drivers. Boats & Watercrafts – May be parked on your site or in the designated boat parking area. No storage or parking fees. Golf Carts – Permitted in Lost Lands. Can be operated by licensed drivers only. Pets – 2 pets per site maximum. Aggressive dogs and aggressive breeds are prohibited. Guests are not permitted to bring pets. Guests – Your guests are welcome, but must know and abide by Lost Lands Rules. Lost Lands does not charge a per-guest fee. Decks – Must be built in 4’x8’ sections in accordance with Sussex County rules. Silvertop Screen Rooms – Lost Lands is an authorized dealer for Silvertop. Sheds – Size is limited to 8’x8’x10’ in accordance with Sussex County, DE rules. •Wooden sheds should be painted white with accent trim matching your RV. •Vinyl sheds must be anchored. 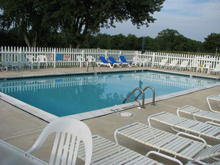 Pool – Open daily Memorial Day through Labor Day (minimum). Children under the age of 16 must be accompanied by parent or legal guardian. Nature Trails – Enjoy the natural wooded beauty of Sussex County and take a walk though our Nature Trails. If you are quiet, you will likely see deer, turkey, squirrels, fox and other wildlife co-habiting our campground. Winter Storage – RVs are permitted to remain on site at no additional charge provided the deposit for the next upcoming season has been paid. Note: The information provided above is intended for general informational purposes only and does not constitute the official rules and regulations of Lost Lands RV Park in whole or in part. This information is subject to change without notice.